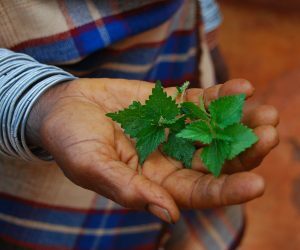 Dzaluma – an edible wild leaf vegetable that is found in abundance in the Soutpansberg mountains, is particularly tasty. Dzaluma,is named as Laportea Pedunculuris.It is one of our deliciuous leafy vegetable from the wild.Dzaluma,delele(corchorus confuses),muvhazw(Urera tenax) and vowa(Amaranthus) ,they are all jelly like vegetables after they are cooked.We can mixed one of each of these vegetable with tshibavhi(monordica balsamina which is another wild leafy vegetable that is bitter.We can also mix them with pumpkin leaves.Tody people mix them with spinach. This is what Dzomo la Mupo women elders reminds us that these were the vegetables with pfushi(pfushi is nutritions). For Dzomo la Mupo recognising food sovereignty in variety of food found from the wild..